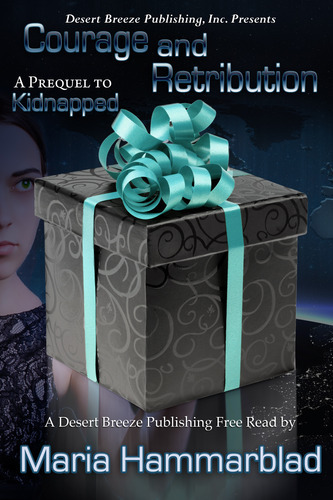 Courage and Retribution is a novella accompanying my novel Kidnapped. It's pretty short, but it's also free! On the outskirts of the ever present Alliance's watchful eye, William Reynolds has served as mayor and preacher for the better part of a decade. Life is good, and he sees no reason to change anything. When a family fleeing the Alliance's oppression comes his way he still doesn't hesitate to hide them. Reaching out to the people in need proves to be more dangerous than he could ever have anticipated, and once events are set in motion, there is no going back. The fragments of memories and dreams came together. He was a prisoner of the Alliance, and his people, everyone he knew were dead. It was his fault. He didn't understand how, he had been so careful, but he still led the enemy right home. 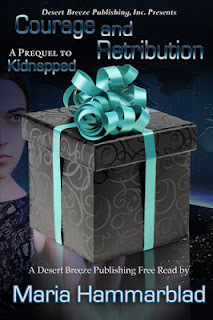 He wanted to return to the darkness, hopefully forever, but the woman wouldn't let him. She held a cool hand against his forehead. "I think he has a concussion." A cynical male voice answered, "It happens." William opened his eyes again and struggled to sit up, even though the room revolved around him. Everything bathed in a light so bright it shot bolts of pain through his skull, but when he squinted and shaded his eyes with his hand, he could make out four bare metal walls and a metal ceiling. The cell didn't even have a visible door. "Where am I? Who are you?" The man stepped closer and crouched next to him. "You're a guest here at Casa del Travis. If we're lucky, he'll forget about us, or kill us before we reach Central." The woman said, "You should probably lie down. You're still bleeding. I'm Isabela, and he's Aaren. I think there are more people in other cells. I can hear them through the walls." Aaren chuckled. "Of course there're more prisoners here. This is a prisoner ship, and it's what they do. So, what'd you do that's so bad they let you live?" Curious yet? Download it for free!